Coming soon! Functional fitness classes to fit YOUR needs! Don’t li ke big classes or just getting started exercising? Small group exercise classes have no more than 10 participants to allow for more focused coaching attention. Exercising most days of the week improves health over time and has many benefits! More energy to be active, play with your kids and grandkids, and do yard work! Reduced risk of some chronic diseases (heart disease, diabetes, etc)! More confidence and better self-esteem! 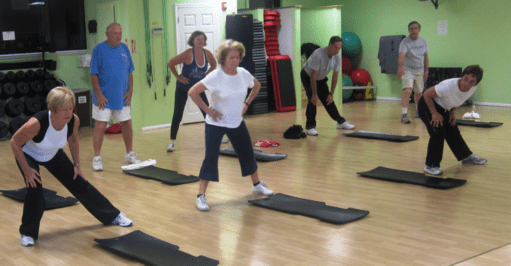 Our 55+ small group classes are designed to meet your exercise needs! Class times and pricing vary and registration is limited! Contact me for class availability and to register for a class!